About an hour ago, King County Executive Dow Constantine, Sheriff Sue Rahr, Prosecuting Attorney Dan Satterberg and others unveiled a new proposal to reduce the amount of budget cuts faced ... Read more.. It won't be final until and unless Teamsters Local 174 members approve it, but they're voting Sunday on a proposed contract deal with Waste Management. 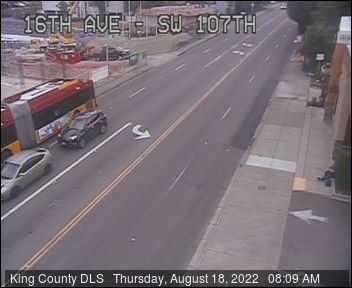 That's according to our regional-news ... Read more..
Seattle Police confirm that a victim in last week's crash on the hill toward 509 (at 3rd/Olson; map) has died, and they are looking for witnesses. Here's the update. Read more.. The North Highline Unincorporated Area Council has four positions to fill, and the filing period is open for just three days - this Monday through Wednesday. The districts are described ... Read more..
At the Joint Training Facility just east of White Center on Myers Way South, Seattle Fire Department personnel and Fire Explorers/Cadets rallied this morning to get into a high-spirited mood ... Read more.. Couple notes about White Center-headquartered Full Tilt Ice Cream. Their live music series has added a monthly folk/bluegrass night (as noted here on the FT Facebook page) - last night ... Read more.. If you get trash pickup from Waste Management, you can stop worrying about what'll happen if the Teamsters' strike drags on - it's over as of late this afternoon, after ... Read more..
We've covered its trials and tribulations in recent weeks and now there's one final note from the proprietors of the Hang Around, at the spot of the former Wall, left ... Read more..
What's happening - or not happening - in local crime trends? How can you help make your neighborhood safer? those are just a few of the things you can expect ... Read more.. Waste Management, with a service area including White Center, has just gone on strike. Here's a report from our regional-news partners at the Seattle Times; more to come. Read more..
Traffic alert as of 8:56 am Wednesday - there's a crash affecting traffic on the hill between White Center and Highway 509. No further details but just a heads-up that ... Read more..
On the West Seattle/White Center border, the Seattle Fire Department's Joint Training Facility will host the "Fire Muster" for cadets and explorers this Saturday, 9 am-4 pm. According to this ... Read more..
Metro notes that some bus riders from/to White Center will be among those affected when the Spokane Street Viaduct Widening Project ramps up to its next phase in mid-May. Read ... Read more..
(WCN photo from August 2009, just before the former Evergreen Pool closed) With two weeks to go till the grand opening, following eight months out of service, Evergreen Community Aquatic Center ... Read more..